New ArtBridges/ToileDesArts website coming this week! / Le nouveau site Web d’ArtBridges/ToileDesArts, en ligne cette semaine! We hope that you will find it easier to search for content and to submit things related to community-engaged arts and arts for social change initiatives in Canada. We’d love your feedback. We hope that the site will become rich with use and grow over time—because of all of the amazing things that you and others contribute to it and read on it. We hope it will really become a place for learning, resource exchange and connection-making and because of that—communities across Canada can have improved access to arts and art-making opportunities. We’d like to thank the individuals, foundations and the Ontario Trillium Foundation that helped make the website creation and development happen. Thank you for your belief in the relevance of creating a hub and forum for community-engaged arts in Canada. Cheers to the amazingly talented, innovative and creative team of people who worked on creating and developing the new website. Nous l’avons conçu pour qu’il soit plus facile d’y chercher du contenu et d’y soumettre de l’info en lien avec l’art communautaire et l’art engagé au Canada. Vos commentaires sont les bienvenus! Nous espérons que ce site s’enrichira à l’usage et avec le temps — grâce à tout ce que vous nous fournirez comme contenu intéressant pour que le milieu de l’art communautaire puisse en bénéficier. Nous espérons qu’il deviendra un lieu d’apprentissage, d’échange de ressources et de rencontres déterminantes et qu’ainsi, les collectivités partout au Canada auront un meilleur accès à l’art et à la pratique des arts. Nous tenons à remercier les personnes et les fondations, et en particulier la fondation Ontario Trillium, qui nous ont permis de créer ce nouveau site. Merci d’avoir cru qu’il est pertinent de créer une telle plateforme pancanadienne, un tel forum pour l’art communautaire et l’art engagé. Merci et bravo à l’incroyable équipe qui a mis ses talents à contribution pour concevoir et mettre en place ce nouveau site. Bonne visite, bon voyage sur la ToileDesArts ! Veuillez s.v.p visiter la carte Google pour l’information de contact. Lire d’autres postes de notre blogue au sujet de la Fondation Michaëlle Jean ici. 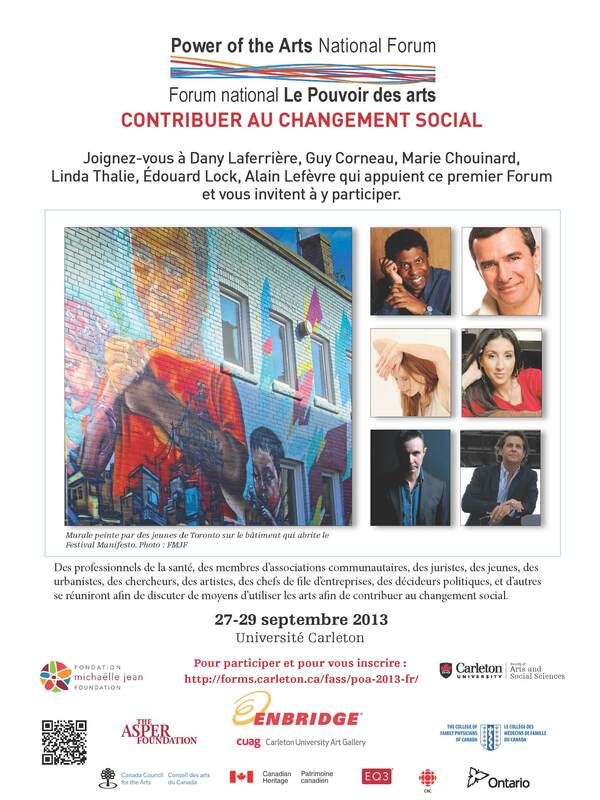 Read other ArtBridges’ posts about Michaëlle Jean Foundation here. Main Arts Activities: Manifesto produces a variety of programming throughout the year, including an internship program, workshops, artist talks, townhall meetings, and more. The organization is most recognized for the annual Festival of Community & Culture, a celebration of music, visual art, dance and culture. Rooted in hip hop, this festival works to unite, energize, cultivate and celebrate Toronto’s vibrant, diverse youth arts community. In the last seven years, Manifesto’s Festival has featured unique, socially charged initiatives that boast commercial level productions. The Festival has promoted over 1000 emerging and established Canadian and international artists to a wide audience – and specifically to diverse youth aged 14-29. Mandate: Manifesto works to unite, inspire, and empower diverse communities of young people through arts and culture. 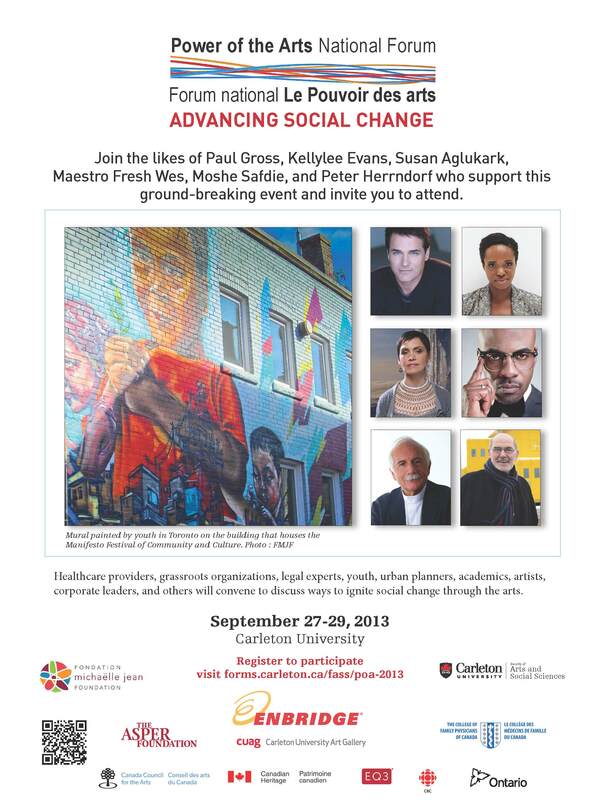 Manifesto’s 7th annual Festival of Community and Culture is coming up Sep 19-22, 2013! Artist announcements coming soon! Join us as we celebrate the arts, community and culture through a unique experience that only Manifesto provides. See what talented local and national artists have to offer from dance, music, art, education, comedy, food, clothing and crafts, and so much more. Manifesto’s annual Festival of Community and Culture is a celebrated event in Toronto which attracts over 40,000 attendees over a span of four days. The mission of the festival is to showcase creativity and culture from diverse communities of young people and to support top notch talent. Mark your calendars, September 19 – 22 and get ready to celebrate! 37 Bulwer is a social hub where great energies merge! Our space has been used to host; artist talks, yoga classes, gallery exhibitions, workshops & collaborative meetings, culinary events and other creative endeavours. The venue is located at 37 Bulwer Street in the heart of downtown Toronto, just north-east of Queen St. and Spadina Ave. Steps away from creative industries of Queen West, the space is a unique venue for hosting events, parties, and gatherings. If you are interested in visiting or booking our space, please visit themanifesto.ca/space or contact space@themanifesto.ca. Are you an artist with an amazing talent or skill that you want to teach to youth? Are you looking for new employment opportunities within your art form? Or, are you just looking to develop and refine your facilitation skills? “The Art of Facilitation is a train-the-trainer workshops series for youth (13-29 years) that infuses popular education techniques with the presentation and facilitation skills needed to engage diverse youth audiences. These interactive and engaging workshops will train you in the areas of facilitation, workshop planning, presentation skills, and creating safe and inclusive spaces. In addition to this training, you will receive feedback on your facilitation style/approach, individual mentorship from an experienced facilitator in the field and receive a certificate of completion! So whether you have facilitated before or have never transferred your skills to an audience, The Art of Facilitation will assist you in creating an engaging workshop experience that everyone will love. Read our ArtBridges profile on ArtReach Toronto here. Main Arts Activities: The Network engages arts/health users, organizations, decision makers, and the broader public to understand and support the connections between health and arts-based activities, as well as the multitude of ways that the arts can contribute to lowering costs, increasing effectiveness, and supporting the sustainability of our public health care system. We are also the primary source of arts and health information and resources in Canada, providing a platform for arts and health knowledge translation. Mandate: The goal of Arts Health Network Canada (AHNC) is to bring arts and health activities into the mainstream of Canadian life so that all Canadians are able to engage in the arts to enhance their health, well-being, and improve their quality of life. Artbridging: Other community-engaged arts initiatives are invited to become community participants and gain access to our resources. “Lake Country ArtWalk, the largest of its kind in the BC interior, showcases original works of art and live performances created by visual and performing artists living in the Okanagan Valley. More than 300 artists of all media are exhibiting over 3000 original works of art. The event plays host to over 7000 visitors. 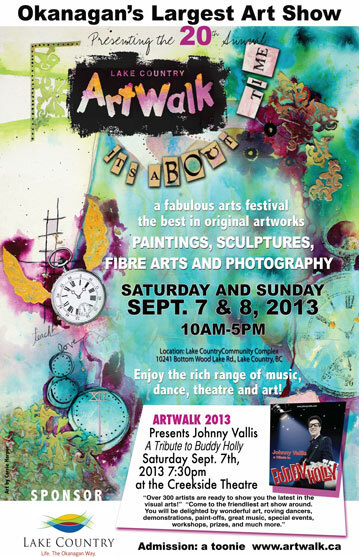 Proceeds from ArtWalk go to supporting the arts in our community. To read other ArtBridges’ posts about Lake Country Art Walk, please click here. Subscribe by email to this blog! Créer une toile de réseaux et faciliter la collaboration entre des projets, des programmes, des organismes et des ressources en arts communautaires dans le but d’enrichir des communautés canadiennes.